Your first client may be your most important one. They may also be the toughest client to get. As a freelance writer, clients want to see that you have experience. However, if you’re new to freelancing then you may not have any experience to share. It’s a frustrating circle. The good news is that there are several ways to gain your first client and that valuable experience that you need. Let’s talk about how to get your first clients and then help you step things up and gather even more valuable clients for your business. Job sites provide you with the opportunity to gain a freelance job. The downside to many freelance job sites is that they often don’t pay well. However, if you’re looking to build your portfolio and your experience then the fee is secondary. You can quickly get the experience that you need through sites like Upwork, Freelancer and others. Non-profit organizations need help. Your valuable skills can benefit them and give you the experience you need. And people who work for non-profit organizations are generally very good about paying it forward. When you do a great job for them they may become your best referral source. Some freelance providers can benefit by doing work on spec. This means the client doesn’t pay for the work unless they like it. If they use your work then they pay you. It seems risky, but whether you get paid or not, you’re getting material for your portfolio. Ask for referrals from people you know to get work like this. How many clients do you want to have? Do you want a full schedule, 40 hours or more a week? Or do you want just a few clients annually? Part of building a freelance business that meets your goals is to focus on marketing your business and getting more clients. Here are a few tips and strategies to get more clients for your freelance business. Networking both online and off is a fantastic way to build a solid freelancing business. Online and off you can connect with potential clients and potential partners. Partnerships with other freelancers can be extremely profitable. For example, if you’re a web content writer, you might partner with a graphic designer to create complete website packages for your clients. And when you know other business owners and build those connections, you never know where work or referrals will come from. And speaking of referrals, that’s the next point. Word of mouth is excellent. It truly helps build a freelance business because the testimonial for your business is coming from someone else. You can encourage word of mouth by offering a referral bonus. For example, any client that sends a new client to you gets a percentage off their next project. You can maintain your referral business and track referrals by simply asking each new client how they’ve heard about you. One of the best ways to get more clients and to establish your credibility is to have a winning portfolio. You also have to make sure your portfolio is available to view. The easiest way to accomplish this is to place your portfolio on your website or blog. If you’re a graphic designer or photographer then you can use a light box on your website. If you’re a writer then you can easily post writing samples, but make sure you have permission from clients to do so. List the companies you’ve worked with. If they have websites, then link to them. Your portfolio or resume helps establish credibility. It gives potential prospects some confidence that they can count on you to satisfy their needs. Many writers start with freelance sites and rely on their profiles from those sites, but don’t get stuck there. Have your own website where clients can come to you when they need you, instead of you chasing down work all the time. A website allows you to showcase your specialty, grow your mailing list of potential clients and gives your clients an easy place to refer new clients to. But most importantly, make sure it shows why you’re the go-to person for your type of writing service. Stand apart from the crowd and you’re more likely to attract the precise client you’re looking for. As you’ve probably gathered, there are abundant opportunities for freelance writers online. You just have to get out there and get them. 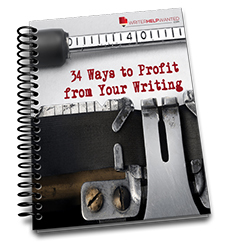 If you’re ready to start brainstorming on the writing markets you might explore, we’ve got a free guide called 34 Ways to Profit from Your Writing. It’s a sneak peek into our Writer Help Wanted membership that gives you the training, resources and handy tools to help you write for a living.